I'm a bit shy and a complete newbie with forums(You dont know how long it took me to find "write a new topic" button that was in front of my eyes) I should also say that my english isnt too good either,I hope that you can live with that. I like to draw a lot,I'm not sure thought that am I going to post any drawings on this web site. I have played Tekken at several points of my life,when I was small and playing with a playstation,few years later at my best best friends house on ps2 and now,still with ps2. Tekken is something thaty has existed all my life literally. The best Tekken I ever played was Tekken Tag Tournament. While I was still young,I didnt quite get what was going on in the series thought and I also thought that the characters looked creepy. 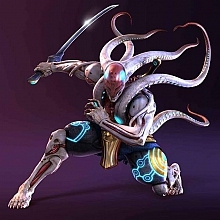 Yoshimitsu was one of those characters I thought to be absolutely scary,yeat I still played as him a lot. I liked his p2 costume a lot and thought that his p1 costume(from Tekken 3) was ugly. It also made me think a lot about why he looks like that. Now years later,I saw Tekken 3 for ps1 in a local game store that I visit often. I coudnt help myself so I bought it. When I got back home with it,I played for a while and once again started to think why Yoshimitsu looked like that. I hope that I didnt make you bored with all my blabbering. Welcome to the clan!!! I'm Matt, it is great to meet ya, and learn some about your history with Tekken... Enjoy your time here! Thanks I'm pretty sure that I will spend a lot of my time over here. Welcome to the Manji Clan!